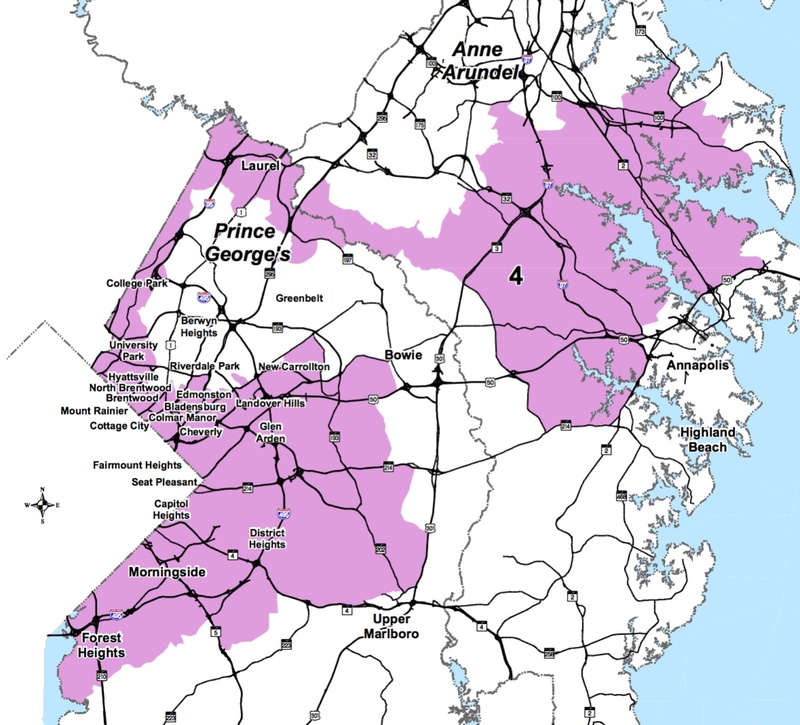 Is an Incumbent Delegate Getting Pushed Out? In 2006, Senator P.J. Hogan and Delegates Nancy King and Charles Barkley became fed up with their District 39 colleague, Delegate Joan Stern. Four months before the election, Hogan, King and Barkley announced that they would not be running with Stern for reelection. Barkley told the Gazette, “She’s being dropped… I would say it just was not working as a team. I think the three of us [Hogan, King and Barkley] really work well as a team, but not the four of us.” That left Stern vulnerable to challenger Saqib Ali, who later picked up the Apple Ballot and defeated her. Is this happening again in Anne Arundel County? Wait a minute! DeGrange, Beidle, Chang and Sophocleus are all members of the Team 32 Slate account. Bartlett is not. Unless a fourth House seat is magically created (it won’t be! ), someone is on the outs. The Capital Gazette notes that none of the incumbent Delegates has announced plans to retire, although it reports speculation that Sophocleus (who is 78) might leave. Let’s remember that Sophocleus had bypass surgery in 2014. 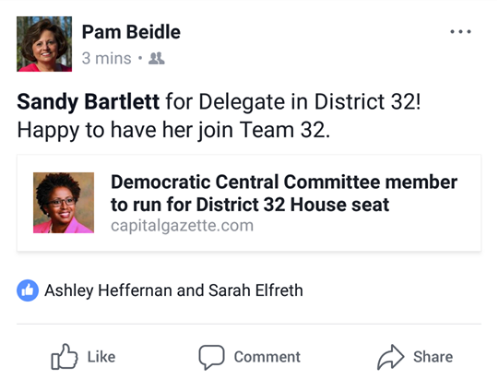 Additionally, Bartlett (who is African American) brings diversity and gender balance to the delegation ticket. All of this begs the obvious question. Is Sophocleus getting pushed out the door? 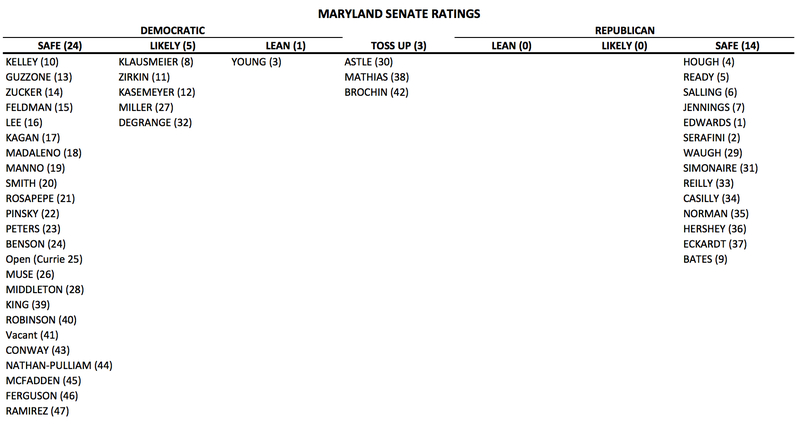 State Sen. Rich Madaleno (D 18) emerged as the surprise winner of the online poll held by the Anne Arundel Democratic Central Committee, coming in first support from about one-third of people who clicked for their choice. It probably didn’t hurt that Madaleno recently attended the District 30 Democratic Club meeting, as well as the Anne Arundel Central Committee Dinner. Other candidates at the dinner included Prince George’s County Executive Rushern Baker, former AG Doug Gansler, former NAACP President Ben Jealous, and Baltimore County Executive Kevin Kamenetz. U.S. Rep. John Delaney (D 6) won the Western Maryland straw poll held in April, with 35% of the 166 participants–less of a shock as Delaney represents this area in Congress. In any case, based on these totally non-random, non-representative samples, it appears that even active Democrats are quite divided, which should make for an interesting primary season. 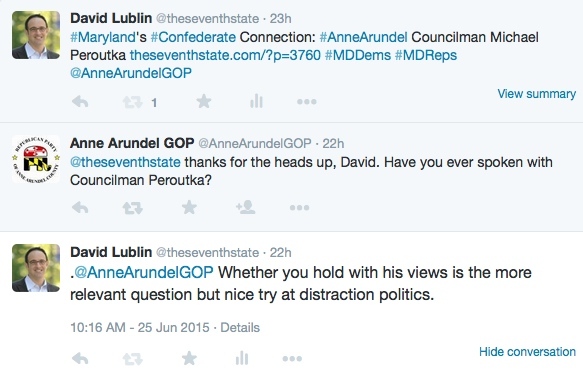 The Anne Arundel GOP seemed at pains to attack my piece yesterday highlighting Republican Michael Peroutka’s well-known love of the Confederate flag and membership on the Board of the League of the South–a hate group. 1. Obfuscation: The real issue, of course, is Peroutka’s views–not whether I have spoken to Peroutka. This is a standard deflection tactic. Do Republicans speak in advance to each Democrat that they criticize on every occasion? I didn’t think so. Indeed, Gov. Larry Hogan didn’t speak to Peroutka before cutting him loose during the campaign. Like me, he didn’t need to waste his time. I also reported on Peroutka’s campaign contributions. Frankly, it isn’t a heavy lift to conclude that Peroutka’s values are heinous. 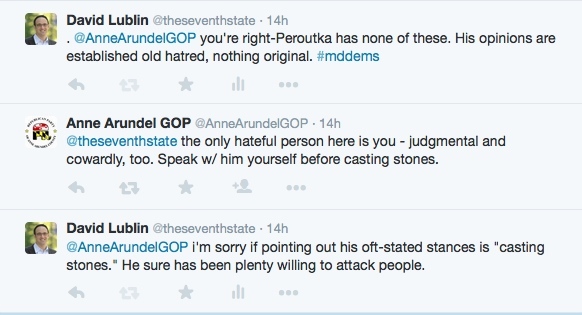 Their willingness to ignore them says a lot about the people currently running the Anne Arundel GOP’s twitter account. If the South is going to survive, especially against a flood tide of massive Third World immigration and leftist attempts to destroy her very cultural and political foundations, she is going to have to seek her independence and govern herself. So I think it’s safe to say that Peroutka and his ilk have no problem casting stones. So my presentation of the facts leads to the same opinion as Governor Hogan. The Anne Arundel Republicans are free to stand by their man. It says a lot about them. The “Stainless Banner” includes the Confederate battle flag in its canton. The white was meant to express the Confederate fight for the supremacy of the white race. Peroutka did his proud rendition of Dixie at the national conference of the League of the South, a secessionist hate group. In 2012. Peroutka got money for his campaign from a variety of source. I suspect, however, that not many Marylanders, can claim that Alabama Supreme Court Chief Justice Roy Moore gave them $1000, as did Associate Justice Tom Parker. Moore is the jackass who was removed from the bench unanimously by his colleagues for violating the Constitution and his refusal to comply with a federal court decision. He spoke to the Council of Conservative Citizens (CCC), the group that inspired Dylann Roof, but claimed not to consider them a “white supremacist” group. During his campaign, Peroutka refused to leave the racist League of the South or give up his on its Board. Yep, and this guy is an elected official in suburban Maryland. Peroutka also received $1000 from Scott Scharf of Scott’s Gunsmithing in Glen Burnie. Scott’s Gunsmithing specializes in custom firearms and gives explicit instructions on how to get around Maryland’s gun laws to build a gun called “the Urban Broom.” No doubt Dylann Roof would approve. As the unacceptability of the Confederate flag goes national in the wake of the nine assassinations in Charleston, many in both parties have looked to see how we can make Maryland a more inclusive place. Refusing to condone the acceptability of Peroutka and his politics would aid that effort. Peroutka, a Bircher secessionist, was disavowed soon after he won the nomination by both Gubernatorial Candidate Larry Hogan and County Executive Candidate Steve Schuh. I think they can feel extra-good about that decision now and I hope they will take a moment to reiterate their opposition to Peroutka-style politics. Armstrong is a real local, having grown up in Annapolis and graduated from Broadneck High School and Salisbury University. has been strongly endorsed by the Capital newspaper. Vote Armstrong on Tuesday. It’s the rare opportunity to help out both the Democratic and Republican parties–not to mention Anne Arundel. The Quinton Report broke this story, which Republican Nominee Don Quinn has now acknowledged is true. Check out the Quinton Report for screenshots of all of the evidence.